Synonyms: "Sad News" The Later Daily Life of the Magic Girl, Sharenima! Pretty Angel Nirvana was everyone's favorite magical girl, and her TV show was watched in every home. But when an office worker's computer goes on the fritz, it brings the once fictional heroine out of the screen and into our world! 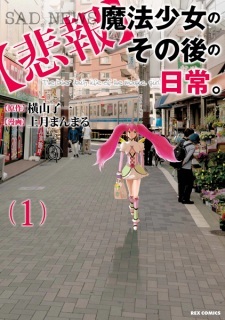 Can this magical girl deal with the unmagical realities of everyday life? Find out what happens when a magical girl is asked to set aside her wand and stop fighting monsters to tackle grocery shopping and paying bills! "Hihou" Mahou Shoujo no Sonogo no Nichijou. has been published in English as Unmagical Girl by Seven Seas Entertainment since December 26, 2017.